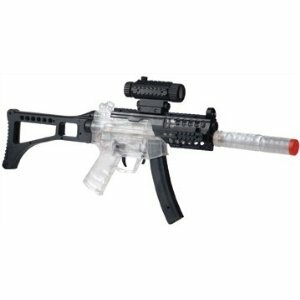 This entry was posted in AEG (Automatic Electronic Gun), Beginners, Intermediate, Review, Rifles and tagged airsoft, airsoft gun, cheap, crosman airsoft, crosman bb gun, full auto, full auto airsoft gun cheap, pulse r71, tac, tac r71 by sirbuffalosushi. Bookmark the permalink. The battery that goes into this gun is specially made for it. It would be incredibly difficult to find a spare without having to buy a whole other gun. Sometimes you can get lucky and find somebody selling one on eBay or Craigslist, but chances are that they’re used and probably costly. As for the voltage, it doesn’t have a specified voltage on the battery, charger, or package. If I had to guess though, it would be comparable to a 7.2v battery. However, it’s not like you could even go out and buy a 7.2v stick battery because the gun has a special terminal connection, not the standard “mini” connection. this gun is a great airsoft for thoes who like cqb! the bullets seam to never run out! but on the other hand you should buy 2 to 3 batterys so that you are in luck 24/7. Dose any one know were the hop up is?? The hop up isn’t adjustable on this gun. But the hop up itself is at the very start of the barrel, where the BBs drop into. Like I told “the man”, there’s no way to adjust the hop-up on this gun. But the actual device that is called the hop-up is located at the very start of the barrel, where the BBs drop into and are held until you discharge them. Do you need the scope to load the bullets and fire the gun? Yeah, the BBs are actually held in the scope. It’s basically the magazine.